When we go shopping for a new gaming rig, we first search for a computer case. We want something having a solid build quality, providing great features and most of all, with great aesthetics. With an increase in the demand of the customers, manufacturers have been designing great innovative computer cases with eye-candy designs. A computer case is one of the core components of our beloved systems and if it is not “perfect” then we do not get the satisfaction in our custom builds. When we talk of full-tower cases, it means that the user will have humongous space to install the components whether that be multiple graphics cards, storage devices or most of all, cooling components such as fans, radiators or other liquid cooling components. You don’t need to worry, as we will be discussing the most jaw-dropping casings ever designed to entertain the diverse needs of even the most extreme hardware enthusiasts in detail. Obsidian 1000D is the flagship case from Corsair which provides premium build quality along with rich features. It can be concurrently used with an E-ATX based system and a Mini-ITX based system i.e. two times each component. This feature depicts the humongous size of the case. The case dimensions are 27.3” x 12.1” x 27.3” (LxWxH). The basic structure of the case is manufactured with brushed aluminum which gives superb looks and has smoked tempered glass panels on sides, front and top. The case weighs 65-lbs which is quite a shocking amount in the PC casing industry making it one of the heaviest computer cases. Large dust filters are placed on the front, top, rear, and bottom to house 2 x 480mm (front), 2 x 480mm (top), 2 x 120mm (rear) trays and the PSU vents. The front panel of the case features 2 x USB 3.1 Type-C, 4 x USB 3.0, Power Button, Reset Button and 3.5mm Jacks for Speaker and Microphone. The case also includes a built-in fan and lightning controller named as “Corsair Commander Pro” supporting up to 6 PWM fans, 2 RGB Strip Controls, and 4 Temperature Controls. Obsidian 1000D replaced previous flagship Obsidian 900D and included tempered glass based design and RGB features. It is also important to note that this case at stock does not include any fan or radiator tray which will further increase the costs as many cases in the market are already shipped with certain fan configuration. All the cable management is done on the back of the motherboard mount area and behind the side glass, lies a door. 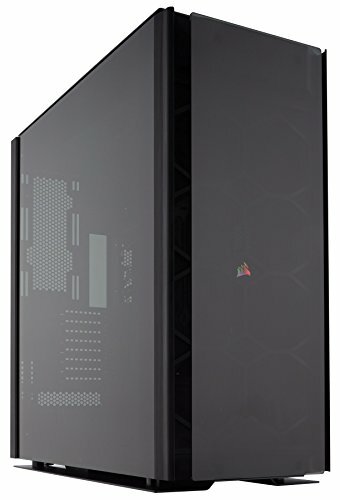 The case comes with a 2-year warranty by Corsair which is enough for a PC case. It is a pretty expensive case only targeted at extreme enthusiasts who don’t care about the price and want just the absolute best. Thermaltake recently released its new series of PC casings, with Thermaltake Level 20 as the flagship. This case has a unique design with three separate chambers named PSU Chamber, MB Chamber and Storage/LCS Chamber. These chambers are specifically designed to isolate the component areas in such a way that heat can be properly dissipated without affecting the independent components. Each chamber has a side-ways opening tempered glass panels while the basic structure has curved aluminum corners. The motherboard chamber can support up to 360mm radiator as well as 3 x 120 or 2 x 140 mm fans on the front and 1 x 120mm or 1 x 140mm fan with/without radiator at the rear, the storage chamber can support up to 420mm radiator with 3 x 120mm or 3 x 140mm fans while the PSU chamber hosts the PSU in either the horizontal or vertical alignment. The front I/O ports consist of 1 x USB 3.1 Type-C, 4 x USB 3.0, Power Button and 3.5mm Jacks for Microphone and Speaker. The casing also includes a Riing Plus RGB Controller for fans and lightning which can be synced with Razor Chroma products. Moreover, the controller features voice recognition for setting various lightning styles or fan speeds with “Alexa” enabled devices. Thermaltake has included three Riing Plus 14 RGB fans and two Lumi Plus LED strips which add decent lightning. There is support for up to eleven internal bays (6 x 2.5″/3.5″ with HDD Cage, 2 x 2.5″/3.5″ with HDD Bracket, 3 x 2.5″ or 2 x 3.5″ with HDD Bracket) though no space for a 5.25″ drive such as optical drives. The motherboard chamber is also fitted with a built-in riser cable for vertical mounting on the PCI-E components especially the graphics card. 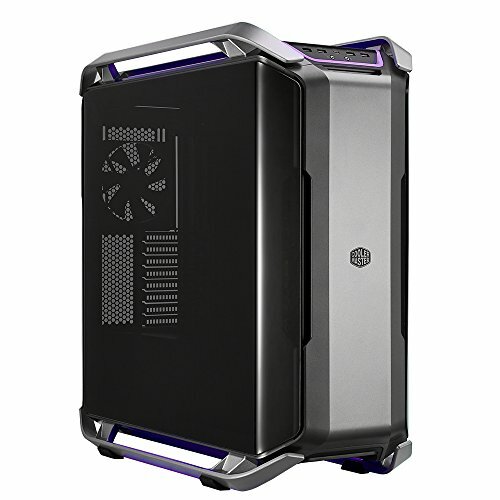 This case is released by Thermaltake upon completion of 20 years since the company has entered the computer industry and this is why it was released at a premium price making it more of an antique piece than a regular computer casing. If you are a fan of Thermaltake products then this case might intrigue you a lot, otherwise we will recommend considering other choices. Cooler Master Cosmos C700M is from the “Cosmos” series which is Cooler Master’s top-end series. The structure of the case comprises of aluminum and plastic with curved tempered glass panels. Two RGB strips are also embedded in the front and top aluminum area while on the bottom, there is ambient RGB lightning. The case has mounts for cooling solutions on all four sides with 1 x 420mm on the front, 1 x 420mm on the top, 1 x 140mm at the rear and 1 x 280mm at the bottom. Top of the casing provides thick aluminum handles for mobility while the I/O ports are located on the top front area. The I/O ports consist of 1 x USB 3.1 Type-C, 4 x USB 3.0, Power Button and 3.5mm Jacks for Microphone, Speaker, RGB Control Buttons and Fan Speed Control Buttons. A unique feature of this casing is the layout design of the motherboard which is getting trendy. The motherboard can be used in inverse layout or 90-degree rotated layout giving the user a lot of customization. The Cosmos C700M comes pre-installed with 3 x 140mm fans on the front and 1 x 140mm fan on the back and weighs around 50-lbs with the stock configuration. The casing supports up to ten internal bays (5 x 2.5″, 4 x 3.5″ and 1 x 5.25″) with one reserved for optical drives which can be needy in times. The casing also includes a unique design for slanted horizontal placement of graphics card by means of a PCI-E riser and frame. 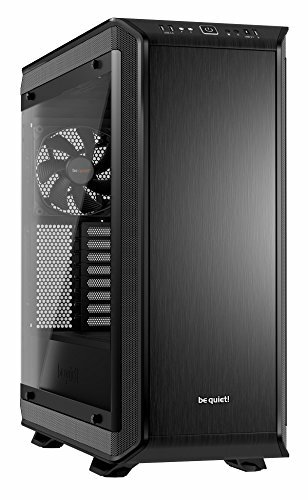 The case comes with a 2-year warranty by Cooler Master in case any RGB or other electronic component becomes faulty. This casing has decent aesthetics while providing a lot of space for cooling solutions. It might not be the perfect case but at this price, you will not get a better product. 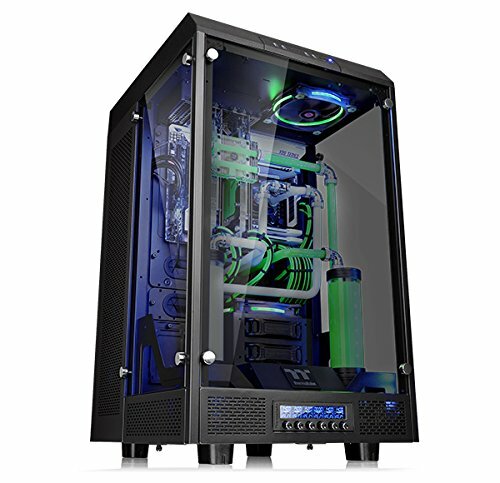 “View” series by Thermaltake is full of tempered-glass panel cases as indicated by name of the series. View 91 is the top model in the view series with tempered glass panels on front and both sides. This casing provides a unique location for radiator mounting, the area for whom is reserved adjacent to the motherboard. Moreover, a lot of fans can be installed behind the motherboard tray for cooling the storage drives placed on the back side. The casing supports 480mm space on the top, 480mm on the front while 420m space at the bottom and 140mm space at the rear. However, a radiator of maximum 280mm can be installed at the bottom due to clearance issues. It provides 2-way GPU placement in horizontal alignment. As for the I/O ports are concerned, there are placements for 1 x USB 3.1 Type-C, 4 x USB 3.0, Power Button and 3.5mm Jacks for Microphone and Speaker. There is space for dual liquid cooling reservoirs to offer maximum cooling potential. Thermaltake has included 4 x Riing Plus RGB Fans in the stock configuration which is a big plus point in justifying the cost of the case. There is space for twelve internal drives either 2.5″ or 3.5″ though no space for an optical drive. It comes with a 3-year warranty which is the more than other manufacturers. The casing also supports Amazon Alexa and Razor Chroma Sync for control and synchronization of products. 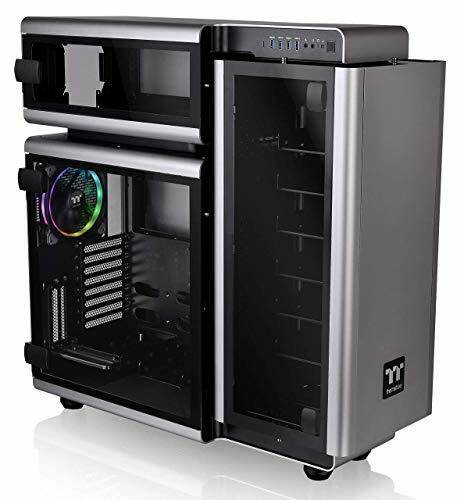 If you are a fan of casings which provide a great view of components then this case is the best choice as it not only allows great view but also support a lot of cooling solutions. be quiet! Dark Base Pro 900 rev. 2 is a computer case targeted towards people who value acoustics more than aesthetics, although it’s not shabby in the looks either due to the brushed aluminum on front and top. It is available in three colors, orange, silver, and black. The major uniqueness of the case lies in the location-adjustable motherboard tray. Also, both the motherboard and storage trays can be mounted inverted creating a mirrored look. Sound dampeners are used in all areas of cooling vents to minimize internal noise. Speaking of cooling vents, there is 420mm space on the top, 420mm on the front, 140mm at rear and 280mm at the bottom. The I/O ports are also unique with a Qi Wireless Charger on top, 1 x USB 3.1 Gen. 2 Type-C port, 1 x Quick Charging port, 2 x USB 3.0 ports, 3.5mm Microphone/Speaker jacks, and a Power Button. The case comes with a built-in dual-rail fan controller supporting up to 8 x fans. A pleasant LED strip also comes pre-installed with six changing colors. The case comes pre-installed with 3 x Silent-Wings-3 Fans manufactured by the same company to aid in acoustic performance. It supports seventeen internal drives and the drive bays are removable to increase air-flow. Case weight is around 30-lbs which is suitable for mobility and comes with a 3-year warranty which is appreciable looking at the cost of the case. This case is quite an attractive product as it comes at a cheap price considering the number of new generation features. This casing comes at a cheap price while providing premium features making it the best bang for the buck. What is HP_Tools Drive and How to Fix It When Full?